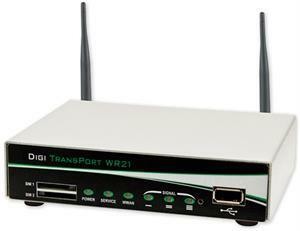 Digi TransPort WR21 is a full-featured cellular router offering the flexibility to scale from basic connectivity applications to enterprise class routing and security solutions. With its high performance architecture, Digi TransPort WR21 provides primary and backup connectivity and is designed for Wide Area Network connectivity including 2.5G/3G/4G networks and beyond. Optional Gobi™ module provides true HSPA+/EV-DO carrier diversity in a single solution. Flexible power and connectivity options, along with extended temperature ranges make Digi TransPort WR21 a versatile product for both commercial and industrial environments. Sierra Wireless AirLink MP70 is a high performance, LTE-Advanced vehicle router developed specifically for mobile mission critical applications in public safety, transit and field services.